This is the first knife to be offered with a SG2 (Super Gold 2) steel blade! 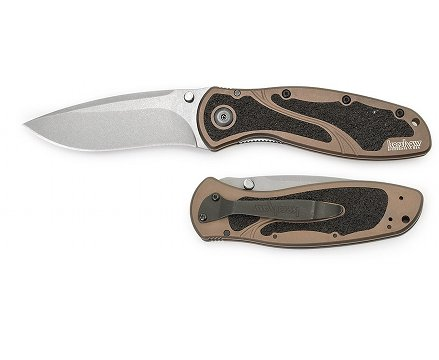 The Blur’s 3 1/2-inch, drop-point blade is hollow ground of super steel- the SG2 stainless. SG2 is powdered steel, which can be tempered to an even greater strength than VG-10. It is extremely dense steel with no imperfections or weak points. This increases its Rockwell hardness to 62-63, ensuring a very sharp, smooth and durable edge. SG2 is clad with two layers of a softer stainless steel (410) that provides additional strength, flexibility, and resistance to corrosion. The result of this structure is that SG2 blades will stay sharp longer than other steels. Overall Length (inches): 7 7/8.